PROVIDE A GUIDE to the extensive primary and secondary documentation that exists for the site through an extensive bibliography and appendices. EVALUATE THE HISTORIC INTEGRITY of the McMillan Site. The historic integrity of the Landmark was evaluated as part of its local landmark nomination in 1989. An updated evaluation of the integrity of the McMillan Site, as a distinct component of the Landmark, is necessary for the development of preservation recommendations for the McMillan Redevelopment Project. PROVIDE RECOMMENDATIONS FOR PRESERVATION of the McMillan Site within the context of redevelopment. The recommendations are specific to the McMillan Site and are intended to inform a successful preservation strategy for a McMillan Redevelopment Project within the general parameters set by the city and VMP. The recommendations take into consideration the site’s significance and integrity and are based on the Secretary of the Interior’s Standards for the Treatment of Historic Properties. General recommendations and resource-specific recommendations are included and will be incorporated into the site plan for the redevelopment as appropriate. 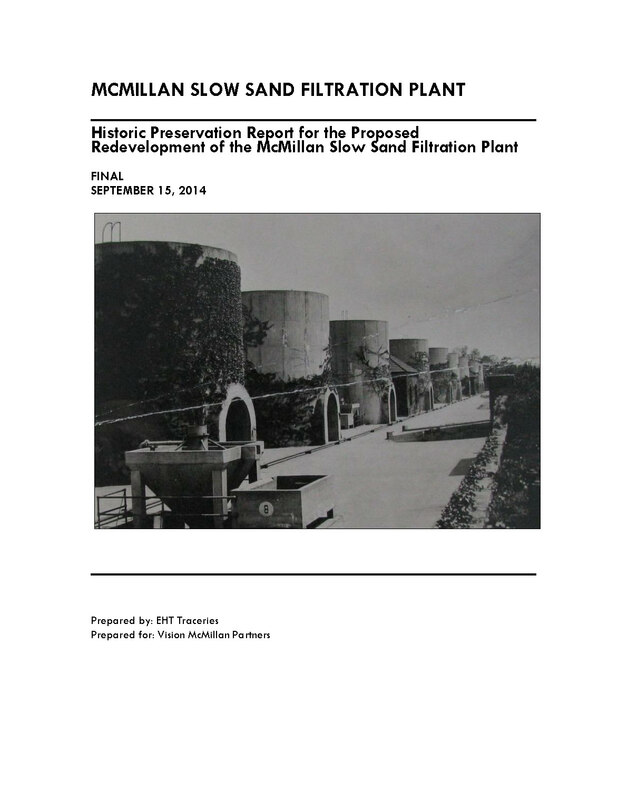 PROVIDE RECOMMENDATIONS FOR PRESERVATION MITIGATION for the McMillan Redevelopment Project. EHT Traceries is conscious of the various interests of the numerous stakeholders in the McMillan Redevelopment Project. To facilitate the future discussion of preservation within the context of other stakeholder interests, this report provides additional recommendations for the mitigation of the loss of historic fabric and integrity that may occur with development at the McMillan Site. These recommendations are intended to be taken into consideration by VMP and DCHPO and can be directly incorporated into the amenities package for the PUD and Mayor’s Agent submissions as appropriate. GUIDE THE PRESERVATION-RELATED APPROVAL PROCESSES for the McMillan Redevelopment Project. Because the McMillan Site is part of the lager McMillan Park Reservoir Historic Landmark, any construction or demolition on the site is subject to a variety of preservation-related reviews on the federal and local level. This report seeks to outline these reviews to clarify the approval process for the project.